DataRecovery.com president Benjamin Carmitchel says his big domain purchase was worth it. In 2008, ESS Data Recovery bought the domain name DataRecovery.com from Associated Computers, Inc. of Minnesota for $1.659 million. I recently caught up with company president Benjamin Carmitchel to find out how the deal played out now that he has ten years of experience with the domain. 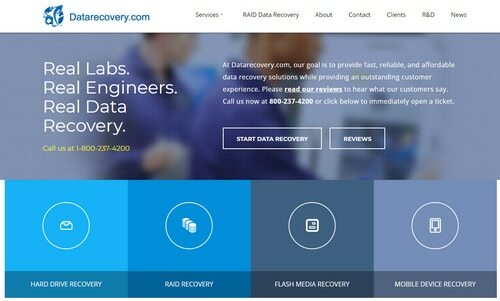 The company formally changed its name from ESS Data Recovery to DataRecovery.com, Inc. after acquiring the domain name, making it easier for customers to remember its name. Switching to DataRecovery.com also helped the company win new business without advertising. “Before we bought the domain name we were spending a quarter of a million to half of a million a year in advertising on things like Google Adwords and print ads,” Carmitchel said. Now the company has eliminated almost all of its advertising because it’s so busy. Carmitchel attributes a lot of the success to the domain name. The seller financed the purchase of the domain name so DataRecovery.com, Inc. has been paying for it over the past ten years. The monthly payment was like an advertising cost to the company. The domain is finally paid off and Carmitchel has a great domain name that will continue to pay dividends for years to come. Looks like they rank no.1 in the free section. Lowballers and entitled narcissists are the real deadbeats, not the investors in prime undeveloped land. This is a great reference article to share with prospective buyers of truly premium domain names. Yes, and look at Rick’s today too. Oh I really like stories about past sales and what they have turned into, and this one was an obvious winner for the buyer. I know that if my precious data was worthy enough for such services then a good-looking website on a good-looking domain inspires trust in the service provided. I hate to give you homework, but these types of stories are great, maybe you could use your knowledge & skills to see where some other big names have gone to, such as camerasDOTcom… I remember the auction https://www.youtube.com/watch?v=ofOmqMGkfuY , but since then, iPhone has become the most used camera on Flickr and stand-alone camera sales have peaked nearly a decade ago. The domain used to have links, but now seems completely dead. Thanks for a terrific article! He could have bought my domain name Recoverynow.com for a fraction of what he paid and got the same result. I see where you coming from. This is an important report because, while advertising savings are fairly well known by domain investors as just one of the benefits of a premium domain, this is the first time I remember seeing anyone try to quantify it. So in this case, the owner estimates ad savings around a quarter to half a million dollars a year. Let’s call that 350K per year, so over the decade of ownership, the savings could be up to 3.5M – or double the cost of the domain. This indicates that in the situation of deploying a category killer name like DataRecovery in a competitive industry, the “high” cost of a super premium domain could be recouped in as little as five years just on ad savings! This may not apply to the same degree to premium names in other styles or industries, but the principle must surely apply. Congratulations to Benjamin for having the vision and courage to spend so much on a domain in 2008 in the year of the GFC. Smart investment. A lot of people need to read and learn from this. I owned a company, Contact USA 1990-2001 that was required by our largest clients to have a “Disaster Recovery” plan in place in case of disaster. Data Recovery was just part of the plan that required remote data backup. I just checked to see if DisasterRecovery.com was being used, and discovered that it points to; kingsbridgebcp.com that markets business continuity plans….go figure?